This morning the earthquake in Mexico likely contributed to gold eking out further gains to $1,355/oz, its highest since August 2016. 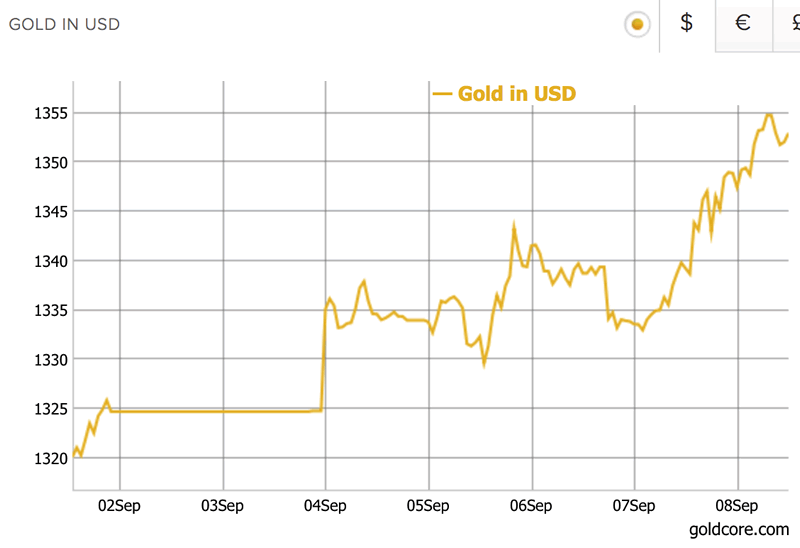 The gold price is now up 2.1% for the week. Sadly some of the short-term performance in both gold and silver is because of devastating events around the globe. From hurricanes and earthquakes to potential nuclear wars. However, as explained earlier this week, while gold is reacting to geopolitical events in the short term, the real driver of gold will be the impact of these events which is government money printing and debasement of the currency. Only this week, Trump extended the debt ceiling – with the devastation of the floods in Texas and Hurricane Irma the latest reason to increase the US national debt. Is the Euro too strong? Yesterday the ECB decided to leave interest rates unchanged. On the back of the decision, the euro rose to $1.20 pushing the US dollar to a 32-month low. Draghi did not express concern over the currency’s strength. Some indication was given as to the when the ECB would taper asset purchases – October is expected. 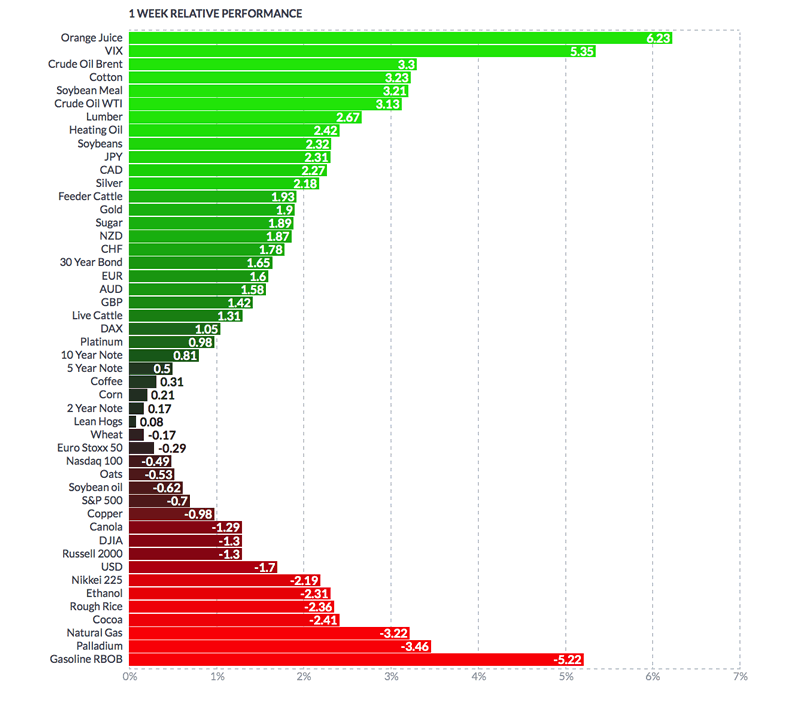 Relative to gold and silver in the last week, the euro has underperformed. Meanwhile in the US weak economic data and events in Texas and Florida have likely pushed any chance of further rate hikes back. Data yesterday showed weekly jobless claims rose this week to their highest since 2015. Hurricane Harvey likely contributed to this and it is likely the start of a trend and will likely get worse. Odds of the increase happening this year have slipped from 40% to 29%. For many a rate hike would be bad news for gold and silver prices. However so far this year this has not proven to be as damaging as some bears expected. Indeed, as we have shown with data and charts many times, rising interest rates generally corresponds with rising gold prices – as seen in the 1970s and from 2003 to 2006. This week President Trump struck a short-term deal with the Democrats in order to avoid a showdown over the US debt ceiling. Many had been worried that the issue would be dragged out by both parties. Republicans were reportedly furious at Trump’s decision. As a result gold fell back somewhat after a stellar start to the week. Many market participants had expected the debt ceiling issue to be a far greater issue than it turned out to be. Of course, it still is a big issue as Trump and the Democrats have merely pushed the can down the road, but for now this is something they (and markets) will likely not worry about too much. There are concerns over the discontent and discord in the White House which has still not passed any meaningful legislation since Trump’s inauguration. This is providing greater support for gold which appears to be gaining strength due to issues in Washington. Is it about geopolitical risks? 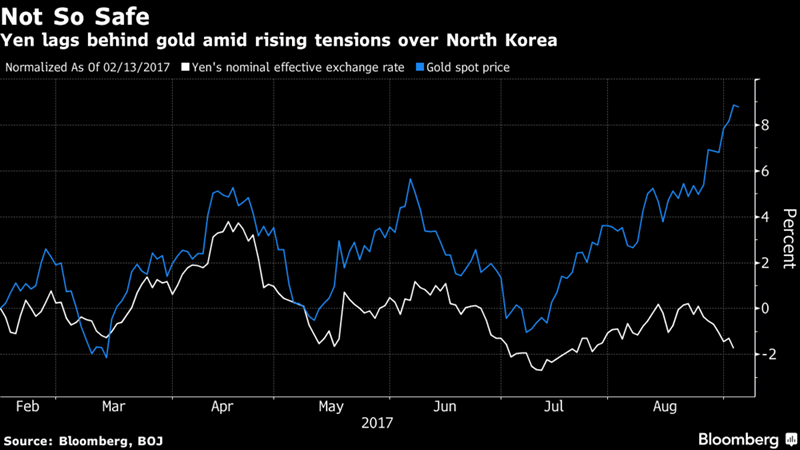 Short-term hikes in the gold and silver price are thanks to expected increases in safe haven demand considering events such as North Korea, potential genocide in Myanmar, Venezuelan economic crisis and of course, extreme weather events and now a massive earthquake. However these are not necessarily the long-term drivers of the gold and silver price. As we explained earlier this week. It is most likely down to concerns over governments and their monetary policies. Trump and his government are of course creating geopolitical risks, however it is the fact that his policis are (and will continue) to result in currency debasement that will provide longer-term support for gold. 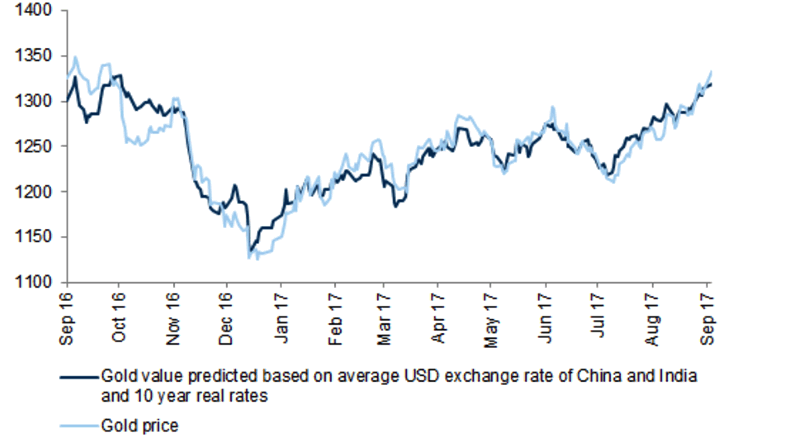 Goldman Sachs’ analysts suggested this week that gold’s rise to one-year highs is thanks to perceived pro-growth promise from Trump which are currently floundering but will result in more money creation. His to-do (and expense) list has also grown as a result of hurricanes in the country. We should rightly pay attention to events happening around the world. They are devastating the lives of so many people. However, when it comes to our portfolios we should not look to the pattern of a hurricane or the sabre-rattling of a dictator to justify our decisions to hold certain assets. Instead we need to switch off the 23-hour rolling news and ask ourselves what this means for the long-term. All of it whether war, recovery from an environmental disaster or peacekeeping operations in Myanmar means spending. Money does not grow on trees and no Western government has any money left … just debt and lots of it. Currency debasement continues on a massive scale globally. This in time will have devastating consequences for our economies and our digital and paper savings and investments. Investors should prepare their portfolios in the same way one would for an environmental disaster or war – with good, solid insurance.